You can’t resist the rich pecan grain finish of this canvas floater picture frame. Its extra deep rabbet is ideal for floating your art or photos on canvas up to 1 5/8” – suspending and separating it from the frame for a striking statement. It’s an Artist favorite! How Do I Measure? Canvas can warp slightly, so measure at the corners for accurate sizing. Handmade from natural wood in the USA. Wonderful frame. Shows off canvases on which a gold frame would be too bright. I have used it on several paintings in the past few months. Have been a satisfied customer for 20-some years. High quality frames at a good price. Favorite style frame is canvas floater and pecan finish gives an especially warm look. I love the quality of this floater frame; it really enhances the wrap-around canvas that I had debated leaving frameless! Well made, quality product made exactly to my specifications. 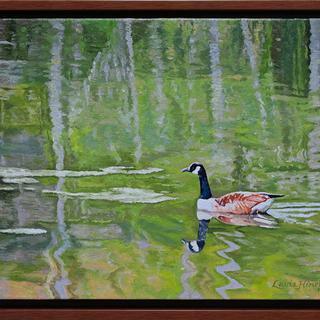 This is an absolutely beautiful wood floater frame, and my painting fit in it beautifully. Love the look of this frame. I really love the look of this floating frame. 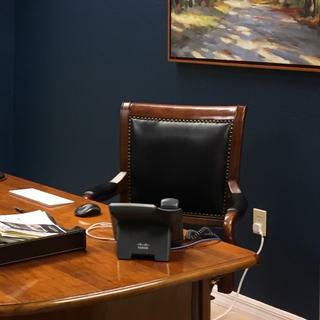 It really sets off the canvas art we chose for my husbands office. Love the pecan frame. It really enhances the beautiful painting it surrounds. Followed measuring directions. Looks great and shows off photo well. High quality frame. Really shows photo off. Very happy with this purchase. Looks beautiful with my canvas. Color is perfect. Beautiful frame for a 11/2” canvas artwork! Beautiful frame...love the color and contemporary look of the frame. The frame is just about 2” deep which fit my 11/2” deep canvas perfectly! Couldn’t find a ready-made frame deep enough for a 11/2” canvas and custom frames were very expensive (and not as stylish as this frame). Yes the frame cost more than the inexpensive canvas I purchased but it was well worth it as it makes the painting much more impressive! Great frames, well constructed to precise measurements. Good for contemporary art or abstracts. These are the 5th or 6th time I bought this style frame and I love them! I have ordered quite a few frames and all have turned out wonderful. Had a problem with one being wrong size,but the return policy was very easy and am re-ordering another one and hopefully this one will fit. The only down side I feel is they are slightly pricey. I received my frame quickly and it was well packed. unfortunately two of the corners were not tightly seamed. I called customer service and was attended to without hesitation. A new frame was sent out and within the week a new frame arrived at my home. I'm very happy with this frame and my canvas fit perfectly and looks great. Very pleased with customer service and will definitely consider future purchases. I love the color and the quality. I framed a painting I did for my son. This frame really enhanced it. I only had some problems with the hardware included. They were a bit of short to screw into the wood. That’s why I only gave 4 stars. Silly me! I should have read more carefully to determine that it isn't real wood. Also, there is too much of a gap between the frame and the canvas. Hello Vesta. Thank you for giving us your feedback. We apologize if the frame did not meet your expectations. Allow me to elaborate on the profile of the frame more. The Pecan Floater is %100 wood with an laminate over lay applied to the wood. Typically this is the way most manufactures apply the finishing to the wood. We are more than happy to email you a UPS return label so that you can return the CFL2 Frame to us for a refund. It also sounds like we need to verify the size of your artwork and the opening of the frame. The frame should only have a gap between the canvas and the top step of the Floater Frame. If you have the opportunity to email us photos of your concern we would like to examine this further. We can be reached at customercare@pictureframes.com. We are happy to send you a free replacement frame if there is an issue with the order. We will contact you today to see how we can find a solution. Thanks again for your business.We truly value your feedback. Hi Vesta! I called you twice this week and was not able to leave a voicemail. We would like to give you the opportunity to return the frame if there is a sizing issue. We are happy to help you get the correct size you need. Can you please give me a call at 1-800-332-8884? We hope to hear from you soon. I like the frame a lot, nice quality, but there is excess space that the canvas sits in by about 1/4”. Hi there, I am sorry to hear the frame did not fit as expected. The float frames tend to have that extra space as the float area if this is what you are referring to. However, we do build in a small allowance to our frames so that when you place the art in it does not fight to get settled in the frame. Canvas can lend it self to this sort of thing due to the wrapped edges at times they can protrude a bit around the corners when stretched and folded. 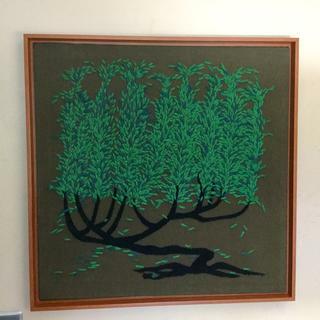 If the frame was cut incorrectly please let us know our number is 1-800-332-8884. Price is great! Quality is good too but up close its clearly a wood byproduct (I guess) underneath a faux wood coating, not real wood. It looks nice though and can't beat it for the price. I would not recommend these frames. I bought two. They look nice but the finish chips off very easily and the corners are not tight. I handled them carefully but still had to touch up in so many places as the white undercoat made every tiny thing show. Hello Donna. Thank you for your review. We regret to hear that the frame arrived in less than satisfactory condition. Typically, we will send a free replacement to make it right with you. Since you took the time and effort to touch up the frames, we have placed a credit on your account. In the future, please give us a call so we can come up with a viable solution for you. If you have any questions, please call us at 1-800-332-8884. Thank you again for your business! I'm very pleased with these Floater Frames. They arrive in impeccable condition with everything you need to rig them to hang. These frames exceeded my expectations. They are the perfect finish for my 1.5 inch canvases. I like how the floater frame doesn't interfere with the canvas by touching it. 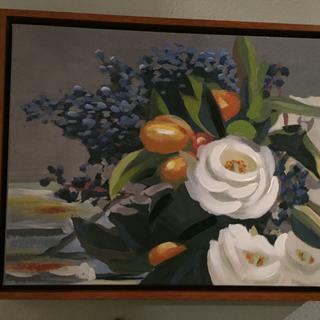 Floater is good for contemporary landscape, and the pecan will look good with oranges in the painting. Elegant, simple, beautiful color to go with my print. 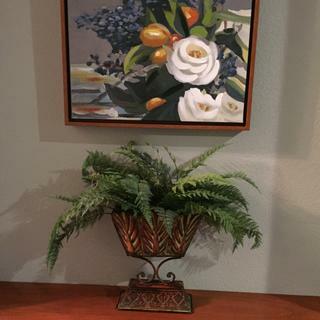 The picture is full of colors and the pecan frame will accent the picture rather than to overwhelm it. Beautiful frame at the size required in a new (floater) style. have ordered frames from your company before,and they are very well made and give my canvas prints an added beauty. The deep rabbit accommodated a wrapped canvas I now want to frame. I have ordered this frame before. It goes well with my artwork. I have had positive feedback from fellow artists and customers. It is a neutral and finished looking frame. It is going on a painting that has not yet materialized! I ordered a corner sample of this frame and it was impressed by the quality of the material. 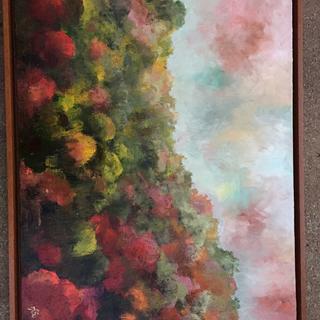 It was a great match for my painting so I ordered the complete frame. I look forward to seeing it on my wall. You were recommended to me. I needed a floating frame for a large canvas painting. The warm color of the pecan should match nicely without distracting from the artwork. Depth of frame for a 1.5" canvas. 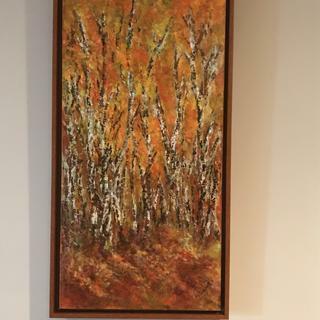 The "Pecan" color will bring out similar tones in the painting. Love this color for warm rich paintings. These are substantial, but not heavy frames. Best canvas floaters I've seen so far. Thanks! Hello, I need a 38'' x 27'' CFL2 frame and I'm wondering what the safety margin is? I mean, if the frame is cut 38'' 1/16 and 27'' 1/16 to allow for minor variances. I see I can order in increments of 1/4 but that will be too much extra room for me. I hope the question was clear. BEST ANSWER: Hello Eduardo. I completely understand what you are asking. We cut by the 1/8" instead of by 1/16". 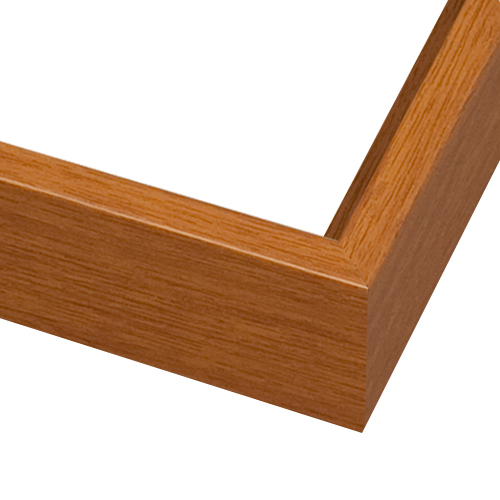 Our frames also have an allowance of 1/8" Therefore, if you order a 38"x27" the frame will be cut at 38.125"x 27.125". If you would like to have the frame sized exactly at 38"x27", we will have to make adjustments to the size. By doing so, that would require us to reduce the size by 1/8" on the width and the height to avoid the allowance. Please call us to process this request. If you have any further questions, please let us know. Thank you for your inquiry. Thank you very much for the comprehensive answer. I will place my order today for a 38''x27''. 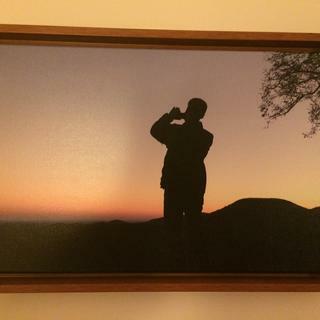 I have a canvas that is standard depth of 1/2” will this frame work? This particular canvas floater has a rabbet of 1 1/2". I recommend taking a look at CFS2 which has the same look but a smaller rabbet of 3/4". Your canvas would sit a bit below the frame opening, but most customers don't seem to mind. If you want to see the frame in comparison to your canvas art you can always order a free 3" sample and review it in person. I sometimes use the deeper frames for standard canvas if I want a shadow box effect. Alternative is to add a strip of 3/4" wood behind std canvas then mount the canvas and wood strip in the frame. Hope this helps. Yes. This frame will work. Your canvas will be lower than (inset into) the frame. Pictureframes also has a more shallow frame that will fit the depth of your canvas perfectly. This floater frame is designed for a deep one and a half inch canvas. You'd be better served with a shallower floating frame. It will, but it's going to sit deep inside the frame. The painting I had (rosebud tree) actually looked great in it. You need the shallow rabbet for this or else you have to add a shim the back of the canvas that you are framing. Not really. Use the CS model. 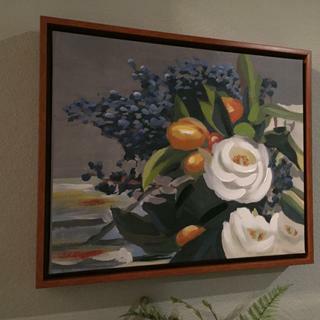 Hi, I would like the frame to wrap around my painting without the 5/16 of an inch of space between the frame and canvas, i.e. be more flush. Is there a way to do this? My canvas is 18x21, and about 3/4-1inch thick. BEST ANSWER: If you look at the dimensional view of the frame, you`ll see the canvas sits on the second step. I suppose you can rig a bracket to secure it to the first step but since your canvas is only three quarters of an inch it would not be flush with the face of the frame. You would also have to subtract 5/8 both the length and the width of the frame to ensure a snug fit and eliminate that 5/16 reveal around the canvas. I like the space between the canvas and the floater frame, so I don't have experience with making the painting and frame flush. Perhaps you can use spacers, creatively colored? I have other ideas, but this one seems to be the easiest. This frame is a floater frame, therefore, the 5/16" of space cannot be removed or altered. If you would like a frame that sits more flush, you would need to switch from a floater to a regular frame. Thank you! Hello, I don't think there is a way to do this because of the design of this frame. Try a floater frame without the built-in mount. My canvas measures 1.25" by 24" by 36". If I order in a 24x36 size, will my canvas fit? Thanks! BEST ANSWER: I agree with Lisa that your canvas will sit slightly under the edge. Personally, I prefer a more even look. I'm not sure if spacers would work in this case because of the design of this particular frame. My canvases are approximately 1.5" and they sit flush with the frame. At 1.25, yours will sit slightly under the edge of the frame. I think it would probably still look good. These are very nice frames. Yes, I think the frame will fit. I order the frame and added a quarter inch in both sides for extra space, and it ended up too much. As long as it is deep enough. My depth was 1.25" on the canvas and it worked. I am looking for a floater frame for a photo picture that I has a depth of 1”. I saw 3/8” on your frames. Do you make the 1”? 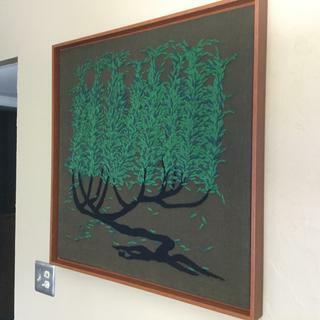 BEST ANSWER: The 3/8" is the width of the frame as you view it on the wall. The depth (rabbet) of this frame is sufficient to hold your 1" work. Hope that helps! Hi Roxie. We have three different depths of floater frames; 3/4", 1 1/2", and 1 3/4". Thank you! My canvas has a depth of 2.4 inches. Will this fit? BEST ANSWER: A 2.4 inch stretched canvas will not be flush with the face of the frame by 7/8ths of an inch. That frame was designed for 1 and a half inch stretched canvas. Your canvas is almost a full inch deeper than the frame and would stick out quite a lot. No, yours is too deep for this model, which is designed for 1 1/2 deep frames. 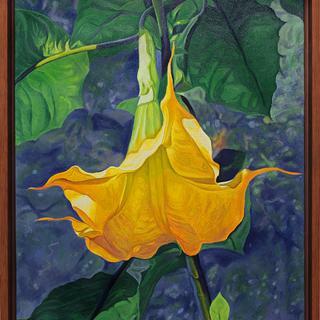 Hi; my art pie e is 36” x 36”; would like the frame to be 38”x38” ; can you do this?? BEST ANSWER: I always go with the recommended ordering size and it works for me. Not sure you would be able to attach your piece to the frame with a 2” allowance, your piece may be too small too fit the frame. You can request frame samples and then measure if you will be able to still attach your painting to the frame with a 2” allowance. Hello Christine. This frame can be made in either size, however, we do suggest to order the exact size of your artwork for best results. Thank you! Is this the widest floater? BEST ANSWER: Our Luxe canvas floater collection is the widest set of floaters that we offer. Thank you! can I order this frame in 4" height? BEST ANSWER: Thank you so much for inquiring about the CFL2. At this time we do not offer a 4" height or width of this frame. The smallest size we can offer is 6"x6". The heavy duty machinery we use to cut the moulding consist of very sharp blades. Cutting a frame at 4" would be too close for our Machine Operators. Please let me know if you have any further questions. Thank you and have a great day.